I am sure that I am not the only one who has noticed that pleated pants are making a big comeback. It has been a LONG time since I have rocked this look – like 15 years – so my apprehensions are a little high thinking about this one. More than any other trend that has popped back up over last few years, this one really screams 80’s to me. And yet, I find myself gravitating towards it. When done right (big emphasis on the done right) I think it can be really cute. Especially when made in a flowy fabric and paired with a tight fitting skinny tee either tucked in or tied off at the waist. So yep, today I am focusing on the comeback of the pleated pants. Where is the best inspiration in ready to wear and how can we make ourselves a great pair for spring? Here are a few of the patterns that I thought would work really well for a similar look. So there you go. I am curious to know what you guys think. I am pretty sure its going to be polarizing. Bring it on! Would you guys ever rock the pleated pants? Do any of these patterns speak to you? Have you tried these patterns and if so what do you think? I could see myself attempting to pull these off… but my biggest *must have* for modernizing them (in my head bc I was born in 87′ & missed this trend) is the zipper at the ankle. I think it completely pulls them out of the baby got back videos and brings them to now. So to all of you who lived through the 80’s, were there zippers on the ankles then or does that just seem more modern to me? Can totally back this up. Skinny stonewashed jeans with ankle zips! Equally shuddering as the stonewashed look is coming back (at least according to the juniors at my hairdressers!). Yep, I third this one and I’m from the Midwest. They were more popular back then than they are now. I can’t do ankle zips today because I hated them in the 80s! I’m going to sit out the pleats this time around. My mommy belly is enough of a problem for me already. I don’t want to go thrusting it the face of others with pleated announcement. However, I do like looks #1 & #3 above. But I feel like you can do those without pleats. 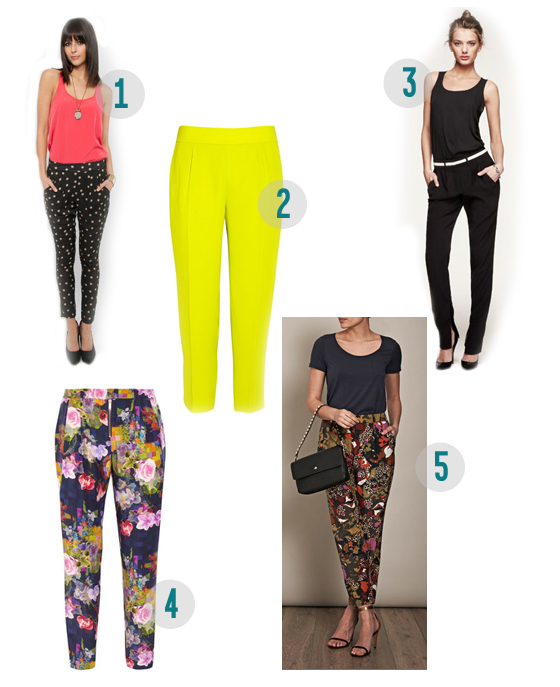 I haven’t sewn pants, but I’d start with the Burda style – I think their pant fit is supposed to be pretty good to start with. Hmmm. I will probably leave the pleated pants alone and admire everyone’s creations from a distance. There are certain shapes from long ago that I an not thrilled in bringing back. Potential hazard- I think if they’re not fitted right they could make the mid section look a little poofy which frankly I do everything I can to avoid. I like them in the glossy mags on the super skinny models though. I’ve been thinking about making a pair myself. I love the look and I think it would be great for gals who live in hot and humid climates. I can’t stand wearing skinny jeans in the summer, but I can imagine that this style would be very comfortable. Not sure how it would work on my mom belly and short legs. . . or how it would look without heels. I guess trying on a pair of rtws is in order. I’ve made the burda style ones and the pattern is great. I made them in a silk linen and wore them all summer long. now we are going into winter I’m going to make them in a light weight wool. I like to think I am not swayed by trends but I have to say I’m pretty sure we’ll all be wearing these soon. But hopefully without ankle zippers or awful acid wash! I haven’t thought about sewing them but this post is making me want to! I would give the first pattern a try. 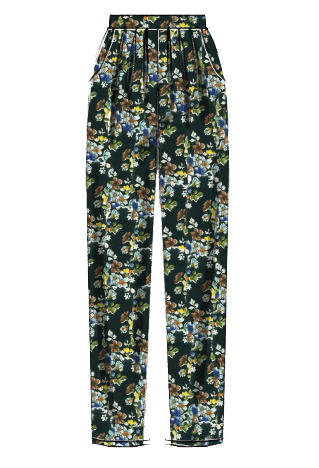 OK, I love the pleated pants trend and I have a pattern in hand that I’ve been meaning to make. It’s a fun style! i ended up making the suzy pant from tessuti. hope that helps.